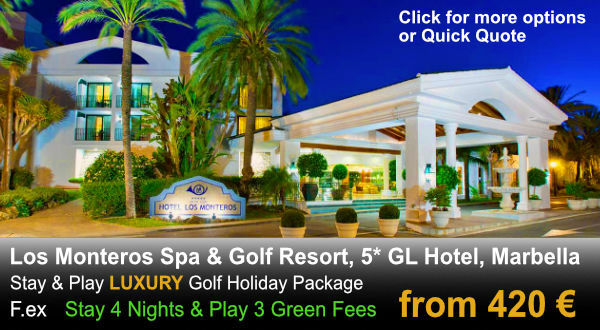 Please find below overview of the so far more than 60 Golf Course where you can Stay & Play with GolfatM. Two 18 holes Courses: Links course, Par 72. 6.373 m. Inaugurated 1992. Designed by Peter Ellis y Clive Clark & Heatland course, Par 72. 6.373 m. Inaugurated 1992 designed by: Dave Thomas. Maximum Handicaps: Ladies: 36 & Gentlemen: 28. 18 Holes. Par 72. 6.884 m. Inaugurated 2001. Designed by Jack Nicklaus. 18 holes. par 72. 6.045 m. Inaugurated 1993. 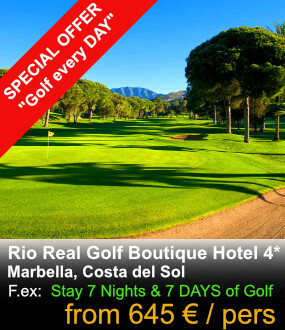 Designed by the legendary player Severiano Ballesteros + 9 holes par 3. 27 holes. Par 72. 6.247 m. Inaugurated 1998. Designed by Dave Thomas. Rincón de la Victoria, Costa del Sol, Spain. 18 Holes. Par 72. 6.016 m. Inaugurated 1990. Designed by D. José María Cañizares. Estepona, Costa del Sol, Spain. Two 18 holes Courses: Old course, Par 72. 6.142 m. Inaugurated 1968. Designed by Bernard von Limburger & New course, Par 71, 5.325 m. Inaugurated 1990. Designed by Paul Krings. Vélez-Málaga, Costa del Sol, Spain. 18 holes. Par 71. 5.698 m. Inaugurated 2001. Designed by José María Cañizares. 18 holes. Par 71. 5.194 m. Inaugurated 2001. Designed by architect Juan Ligués Creus. La Cala de Mijas, Costa del Sol, Spain. 18 holes. Par 72. 5.866 m. Inaugurated 2006. Designed by Javier García Mayoral. 18 holes. Par 72. 5.649 m. Inaugurated 2006. Designed by Pepe Gancedo Gómez. 18 holes. Par 71. 6.021 m. Inaugurated 2005. Designed by Antonio García Garrido.